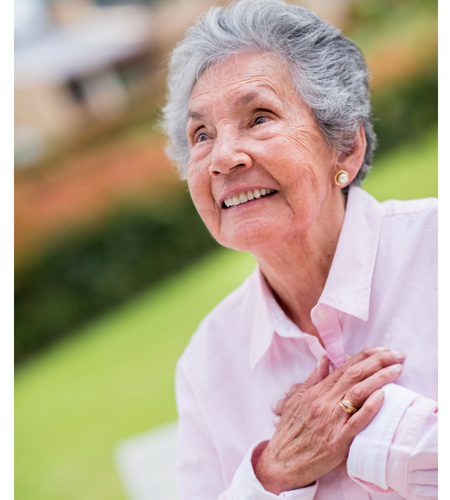 Atrial fibrillation is a cardiac disorder caused due to the irregular and rapid heart rate. The increased heart rate can affect the cardiac functions due to which its efficiency for pumping blood is reduced. This can reduce the blood supply to the vital organs thus increasing the risk of stroke and cardiac failure. Alternative Indian traditional science, Ayurveda offers atrial fibrillation natural treatment to regulate the heartbeats and control the heart rate. During atrial fibrillation, the upper two chambers of the heart called the atria beat in an irregular manner. As a result, there is a loss of coordination of the contractions in the two lower chambers of the heart called the ventricles. Due to this, the amount of blood pumped out of the ventricles with each heartbeat is reduced. Abnormal heart rhythms natural treatment using herbs recommended by Ayurveda principles can help to relieve these symptoms by regularizing the contractions of the atria and ventricles in the coordinated ways. The symptoms of atrial fibrillation, also called A-Fib, include palpitations, increased sweating, shortness of breath and severe weakness. A safest A-Fib cure can be achieved through a regular use of organic herbal remedies and following a heart-healthy diet recommended by an qualified ayurvedic physician. The atrial fibrillation diet involves eating foods that promote the heart functions and avoiding high-fat foods that worsen the heart functions. It offers a safe and natural way to control the symptoms of atrial fibrillation. The diet is highly recommended to obtain a long-term relief from the symptoms of this condition. Some other symptoms of atrial fibrillation include a sensation of a racing, or uncomfortable, heartbeat with an annoying flip-flopping in the chest. Patients may also experience a reduced ability to exercise due to extreme fatigue and dizziness. They may also develop confusion, reduced mental alertness and chest pain due to the irregular heartbeats. The use of natural beta blockers supplements, which contains a combination of herbs can help to relieve these symptoms efficiently and prevent the risk of complications associated with atrial fibrillation. Atrial fibrillation may be occasional or persistent. When the symptoms of atrial fibrillation occur occasionally, the condition is referred to as paroxysmal atrial fibrillation. Patients suffering from this form of A-Fib develop symptoms that come spontaneously, last for a few minutes to hours and later, resolve without any active treatment. Patients can use the natural remedies for AFib to avoid the recurring episodes of paroxysmal atrial fibrillation. In the patients suffering from persistent atrial fibrillation, the heart continues to beat in an irregular manner and the symptoms continue to persist. In such cases, active medical intervention is needed to restore the normal heart rate and rhythm. Patients can contact an ayurvedic doctor to seek an appropriate herbal treatment to manage the symptoms of persistent atrial fibrillation. The doctor may also recommend an ayurvedic diet to avoid worsening of the condition. The home remedies for AFib are aimed at reducing the development of most of these causative factors in order to prevent the irregular heart rhythm. A regular use of natural remedies for heart arrhythmia is recommended for the patients who have a high risk of developing atrial fibrillation due to the presence of these risk factors. Ayurveda also recommends making healthy lifestyle changes such as reducing alcohol and caffeine consumption to prevent this disease. The heart treatments for irregular heartbeat involves the use of drugs that control the heart rate and regulate the heart rhythm. However, some of the allopathic medications prescribed for the management of atrial fibrillation can affect the heart functions, especially when used for a longer duration. Also, the effect of these medications lasts only for a short duration. This means the heart rhythm may again become irregular once the use of these drugs is stopped. Hence, patients are advised to use the herbs for arrhythmia to derive long-term results. Herbal treatment provides natural results by managing the root cause of the abnormal heart rhythm. These herbs also promote the functions of the heart thus regularizing the heart rate and rhythm. The results of ayurvedic treatments using these herbs last longer, are safer and can be taken alone with conventional medicine. Ayurvedic naturopath may advise you to combine the use of herbs with prevention strategies. Some of the prevention strategies for atrial fibrillation include eating a heart-healthy diet, avoiding smoking, increasing the physical activities and limiting the consumption of caffeine and alcohol. A regular use of herbs for atrial fibrillation mentioned beneath can help the patients to obtain relief from the symptoms of this condition. These herbs also regulate the cardiac functions and ensure proper supply of blood to all the organs thus reducing the risk of complications. Arjuna (Terminalia arjuna): Arjuna is considered the best natural heart tonic. It is one of the most powerful ayurvedic herbs that have the potential to regularize the heart rate and rhythm naturally. It can relieve palpitations, sweating and breathing difficulties caused due to atrial fibrillation. Ayurvedic research studies consider Arjuna Terminalia as a cardiotonic. According to Jain et al 2009, Miller 1998 the active organic constituents present in AT such as tannins, triterpenoid saponins, flavonoids, gallic acid, ellagic acid, oligomeric proanthocyanidins, and phytosterols, have been used for centuries in ayurvedic medicine as a cardiotonic for treatment of various cardiovascular disorders, including heart failure. According to Gauthaman et al the crude powder of arjuna bark showed attenuation of ischemia/reperfusion-induced myocardial injury by reducing oxidative stress. Punarnava (Boerhavia diffusa): Natural cures for atrial fibrillation can be achieved with the regular use of Punarnava Indian herb. It can restore the heart functions and ensure proper contractions of the atria and ventricles. This herb also has the ability to protect the heart’s muscle and nerves against degenerative changes and prevent the progress of atrial fibrillation. Brahmi (Bacopa monnieri): Brahmi can be used to reduce the risk of panic attack, stroke and cardiac failure linked to atrial fibrillation. It can support the normal heart functions and enhance the blood supply to the vital organs. Gokshura (Tribulus terrestris): Patients can use Gokshura for arrhythmia treatment natural. This Indian herb possesses restorative properties that can help to regulate the heartbeats and prevent abnormal heart rhythms. Sarpagandha (Rauwolfia serpentine): A research paper presented by Manisha Singh et al, highlights the importance of Rauwolfia serpentine in the treatment of atrial fibrillation/ arrhythmia. Ajmaline is an alkaloid isolated from this herb that has potent antiarrhythmic effect and lowers the blood pressure too. Studies have shown that ajmaline specifically depresses intraventricular conduction, suggesting this would be particularly effective in the treatment of re-entrant ventricular arrhythmias. Ayurveda offers heart flutter alternative treatment that is aimed at supporting the natural functions of the heart. This system of Indian medicine recommends the use of herbs, lifestyle, food, yoga and breathing exercises that enhance the efficiency of the heart naturally so that the blood supply to all the organs is restored. The ayurvedic treatments are also based on the concept of three doshas. The herbs prescribed are aimed at correcting the imbalance of the underlying dosha thus maintaining an optimum balance in the body. 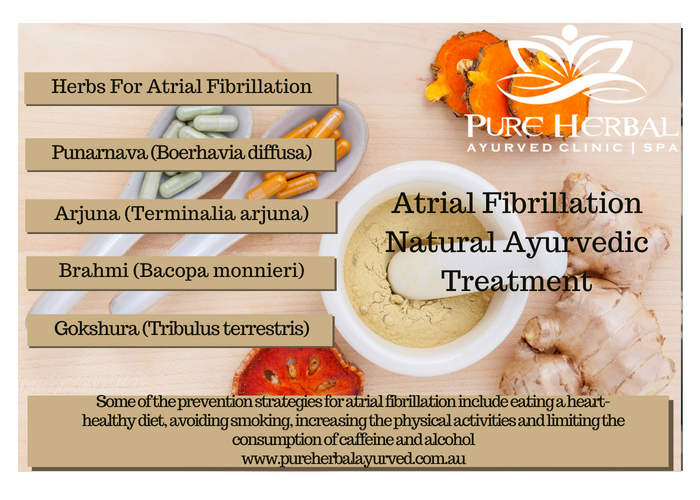 Patients suffering from atrial fibrillation are advised to seek natural treatment at the best Ayurvedic clinic in Melbourne. Ayurvedic medicine in Australia available from Pure Herbal Ayurved Clinic can help patients obtain relief from the symptoms of this condition and prevent the development of complications such as stroke and heart failure. Ayurvedic doctors and practitioners at this wellness centre prescribe natural herbs and a heart-healthy diet to ensure a long-term relief from the symptoms. Ayurveda also recommends a detoxication therapy called Panchakarma that promotes the elimination of toxins from the body and protects the heart against the harmful effect of these substances. The holistic doctors at this natural medicine clinic offer incorporated treatment for atrial fibrillation and help patients lead a healthy life.